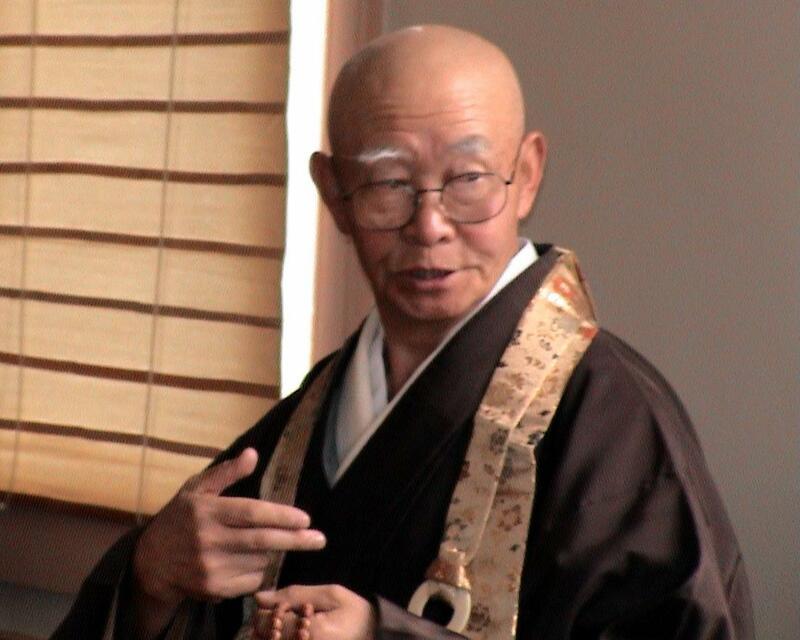 At our 1997 Rohatsu Sesshin (winter retreat), Genki Takabayashi Roshi retired as the active abbot of our Zen community. What follows is his retirement Teisho (Dharma Lecture), that was transcribed for our 1998 winter issue of “Plum Mountain News,” Vol. 4.3. SETCHO’S VERSE:The wild duck! What, how, and where?Baso has seen, talked, taught,and exhaustedThe meaning of mountain cloudsand moonlit seas.But Jo doesn’t understand –“has flown away.”Flown away? No, he is brought back!Say! Say! This story is about Hyakujo who became a famous Zen master in his own right, but in this case he is learning from his master Baso. We find them in a natural setting where a wild duck passes by, and Baso uses this environment to illuminate Hyakujo to the true nature of things. Everything, everywhere is constantly revealing the underlining nature of the universe. When the historical Buddha had his first great awakening upon seeing the morning star Venus on December 8th some 2,500 years ago, he realized that everything, everywhere was always naturally manifesting Buddha Nature Activity. When our eyes are truly open, we realize how astounding it is for a tree to be a tree, a mountain to be a mountain, an animal to be an animal. A river is water flowing. A duck passing is truly just wild duck now passing. Zen realization includes the capacity to know ourselves as mountain, river, tree or wild duck. In other words, while sitting here in the form of a human being, we have the capacity to know mountain, river, tree, or duck from the inside. This is possible because on a fundamental level nothing is really separate from anything else. In this story Baso and his student Hyakujo are most likely walking around the gardens enclosed or adjacent to the temple grounds. While walking, imagine that their steps startle a wild duck in the brush, which bursts forth and flies off. Baso then says, “What was that?” Hyakujo responds, “A wild duck, master.” Baso queries, “Where did that duck just go?” Hyakujo looks a little puzzled and points out, “It flew off this way master.” Baso is not pleased with this response. Hyakujo by his second descriptive answer reveals that he was trapped within his own rational discriminating consciousness, failing to penetrate through the veil of subject and object thinking. Therefore, Baso seizes this opportunity to push his student’s perception to a new level by harshly tweaking Hyakujo’s nose, making him squawk with pain. Baso’s teaching was very kind. After making Hyakujo squeal, Baso said, “See that duck has gone nowhere, it is still here before me.” Hyakujo surely understood what his teacher was getting at. Even so, Baso probably concluded the encounter with a great “Katsu!” or Zen shout, to illustrate that all things in this singular moment of eternity are subtly yet profoundly united, and that from this fundamental level there can be no coming or going. When I was a young boy under the tutelage of Gempo Roshi, he would sometimes, when displeased with me for some reason, grab me by the ear and pull me to where he wanted me to go. And, of course, I would be yelping or quacking quite a bit along the way. Sometimes, I would not even know what Roshi was angry about. When Baso tweaked Hyakujo’s nose, we must understand it to be like the sharp slap of the keisaku (teaching stick), which is not meant as punishment, but used as a device to wake up the receiver to a broader, non-attached awareness of Reality. Baso’s point is that you and the wild duck are both manifestations of Buddha Nature. Buddha Nature is fundamentally indivisible. There is only one kind of Buddha Nature activity though it reveals itself in myriad ways. When our consciousness is able to open up to the underlining heart/mind we immediately realize that nothing can be lost or found, nothing can really come or go. Rinzai, the ninth century Zen Master and founder of our lineage of Zen practice, when asked by his students, “What is the essential point of Zen?”, would often respond by saying, “You here now listening to this discourse are none other than Buddha.” Zen Master Gutei when asked, “What is the essence of Zen?” would not speak at all, but would simply hold up one finger. Gutei never exhausted his one finger Zen; however, here in America, one finger Zen is insufficient to become a citizen. The Immigration and Naturalization Service wants finger prints of all my fingers. In fact I have had to give them my finger prints four times now. The last time I was sent to a Chinese video store to get my “official” finger prints, because they had misplaced the first three copies. It is my understanding that today the I.N.S. is beginning a whole new system to collect finger prints; they seem to understand that they are having some problems. I am skeptical that even now all my fingers will do. Baso would have been happy to see Hyakujo reveal some understanding that was not so attached to his ego bounded perception. How could Hyakujo have done this to Baso’s satisfaction? How can we reveal that we realize and know in our heart that nothing is separate, yet each thing profoundly unique, each moment singular? If our Zen practice is limited to the Dokusan (Interview) room, the Zendo (Meditation Hall), or even sesshin (Zen retreat), we are really missing the point. As students of Zen, it is our duty to make every action an opportunity to be fully present, fully aware, fully involved. For Zen practice to be meaningful, everyday actions in our daily life must become a demonstration of our understanding that everything, everywhere reveals the universal. Do not be fooled; being fully present, fully aware and fully involved in each activity is simple to talk about, but not so easy to do. It takes years of training to move naturally, spontaneously, and compassionately through the real encounters and circumstances of our lives. Zen training, Aikido training and other developmental arts are in some ways just a good start on this process. As complex creatures, it is hard for us to learn how to let go and be natural in a world of such rich and varied possibilities. Recently, I have heard of a machine that makes sushi (Japanese rice and fish cake). There is very little Japanese culture in Montana. Perhaps Joshin (Leslie) and I could buy a sushi machine and make a good business for ourselves, because no one in Montana knows how sushi is really supposed to taste. Sushi made by hand, with the skill and heart connection of a master will be delicious. It can not possibly compare in taste to sushi that is made as a copy of a chef’s work. Even if made well by a robot, how dull it would soon become, without the master’s heart/mind. Someday, there will likely be a computer that will be able to spit out “answers” to koans (Zen parables). What a joke that will be. I would be happy to give you the answers, but they won’t do you any good unless your heart/mind sees through them clearly. Without a heart/mind response, a koan “answer” has no meaning and caries no understanding of the true nature of things. At best, a computer one day may be able to make an “intellectual” or “rational” response, and this might count for 10% of the koan’s true meaning. A few years ago when I practiced with Joshu Sasaki Roshi in New Mexico, he related to me that several of his Zen students were giving strange inadequate responses to his koans. I said, “Oh yes, recently I had seen an English publication of koan answers.” He said, “Ah, now I understand. I’ll just have to make up some new koans.” No one can teach you Zen, how much less can you then learn from a book, but with enough effort and guidance you can realize it for yourself. To penetrate a koan, or gain Zen understanding, just sit, sit, sit. Here on the cushion, face all the trials of pain, fatigue and mental disquiet, and learn how not to be distracted or disturbed. Then, and only then, will your own gut-cleansed understanding bubble up to your awareness. Learn how to be undisturbed and you will gain direct access to your own powerful, creative, compassionate, core energy. Life is our teacher, our only teacher. When we learn how to fully face life just as it is, without clinging to our likes or running from our dislikes, then we will realize our human potential to meet life and death, times of confusion or clarity, without flinching.